They wriggle and creep through the undersides of leaves, looking for their next meal. They eat, hunt, and grow until one day they transform. Weeks pass and a new life splits forth, spreading wings out to dry as it’s carapace develops color and hardens. These voracious predators take to the sky and descend where they see their chosen prey. This Summer, Coming to a Garden Near You! Ladybugs! The Terror of the Aphid! Ladybird beetles, commonly known as Ladybugs are a brightly colored beetle whose iconic red with black spots pattern is instantly recognizable. 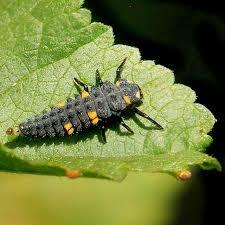 What is less easy to recognize are their larvae. This fearsome looking fellow is the larvae of a ladybug. This is one from about the middle of it’s development. The younger larvae are solid black and the older larvae can show more orange mottling with a marked decrease in the “spikes” covering them. 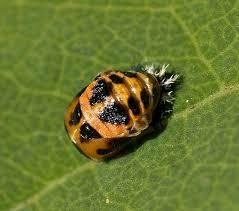 When a ladybug is about to mature from a larvae to an adult it will form a pupa. The pupa looks more like a mature ladybug, however, once the insect crawls free of it, it will still not bear much of a resemblance to the final mature form. While the beetle’s shell is hardening it will be a creamy yellow-orange color, and totally free of spots. Once mature the newly hatched ladybug will be the familiar red hue with black spots. If you have aphids you probably have ladybugs, be sure to check any plants prior to treating them so you’re not taking the good out with the bad!